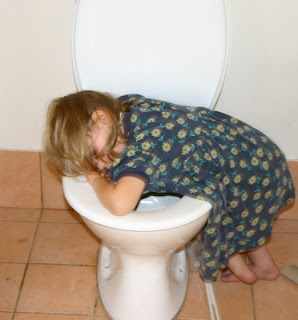 The stomach bug which swept through our family on the day before Christmas meant we missed the Vigil Mass. So we spent some time together and went through why Christmas is such an important celebration and why it is the most important event in human history. In a mix of narration and question & answer format we went through salvation history. First God made a deal (covenant - a binding agreement between family members) with Adam on behalf of Adam and his wife - the first Couple. Then he tried with Noah - a family. Then Abraham - a tribe, and Moses - a people, and David - a kingdom. Each deal was with a larger group of people but each time the human side of the bargain fell through. It was very obvious that unaided Man could not keep his side of the bargain. But the covenant had to be between Man and God and Man had broken the original deal. So Jesus - fully God and fully Man - stepped in and took on the human side of the deal on behalf of all men and paid the price that was necessary to be paid for us to share in the salvation promised by God. At the mention of Adam and Eve, Clare asked a question. "You know about Adam and Eve?" 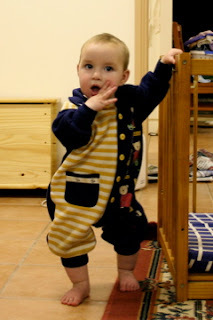 Ah well, the discussion is always aimed at many levels depending on where the child is at. Who would have thought? There we were, listening to Christmas Carols filled with imagery of white Christmases and snow while driving in very hot mid 30C temperatures, when we saw white stuff on the ground! About an hour or so before we reached this spot there had been a huge hail storm. We quickly parked on the side of the road (joining a number of other cars) and hopped out to take a photo. 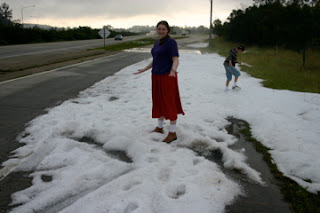 This pile of hail is between pea and marble size and had not yet melted about 3 hours after it all fell. We can just imagine what a mess it was during the storm. On one of the side roads the shredded leaves on the road looked like grass clippings. A number of locals all commented on how green the sky was during the storm. We had planned lots of things with our cousins. 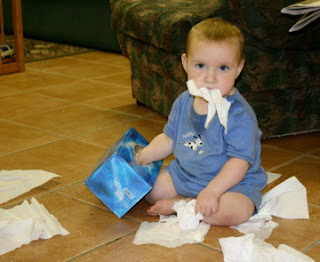 But one thing we didn't plan on - a stomach bug. Eric and Ariel were struck down with a sore stomach which meant we stayed home yesterday - and even missed Christmas vigil Mass. This meant also cancelling a planned fancy dinner with my parents and a very quiet day yesterday. This photo (click for more details) shows how Lana enjoyed the day. Luckily it seems to be a 24 hour thing so we were able to get to Mass today and visit my parents. But fancy meals were a problem. We hadn't planned on needing anything and today all the shops are closed. So instead of a fancy three course Christmas meal, we had sausages on bread with my parents. My sister's husband came down with the same thing so while he is resting we are getting together with my sister and her remaining unsick members and having a scratch meal. It's all good Christmas fun either way. This morning we had the added fun of sharing Christmas morning with my brother and his family. The presents for his children and ours looked quite a sight and each child's excitement increased the excitement of each of the other children. But being meanie parents we still made them have some breakfast first! Once all breakfasts were completed (quicker than normal) we sat down and started passing out the presents one at a time so all could share in the fun of opening gifts. Our nephew, C - 4, received a lolly (candy) filled stocking and announced, "Lollies!". A split second later his sister, L - 3, cried out, "You have to share!" She has learned quickly how one gets lollies! 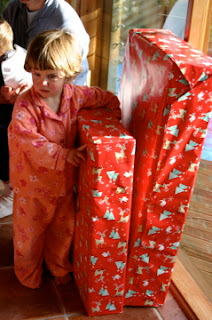 This photo shows L guarding the big present which she had been told by one of her brothers had her name on it. When my brother announced that some smaller present had her name on it she declared, "No. I want the big one." This is her guarding the big one, waiting for her moment. The older nephew, X - 6, received exactly the present he wanted and with a very excited, high voice ran around saying, "A microphone! This is just what I wanted! Santa is soooo clever." 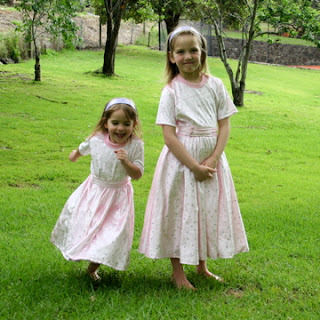 Lana's mum was very busy before Christmas putting together dresses for Clare and Rose. Ariel supplied the material as her contribution and Lana provided assistance. When the girls opened their presents this morning they took a sharp intake of breath and cried aloud, "It's a new dress!" and immediately arranged to put them on. Once everyone else had sorted out their presents I asked both girls to come outside and have a few photos taken. I figured this would be a great time to share their joy. Our first stop was at the Myer main store in Melbourne for their traditional Christmas window display. The windows have been put on since 1956 and are always an impressive display of puppetry. Occasionally they even have a loose Christmas theme! This year was a tribute to the Environmentalist faith about a pristine wilderness, discovered by a fellow who decides to live there with his family. Then tourists come and then a town and the wilderness goes away. Then the people leave the city because there aren't any wild things there and then the town crumbles until "balance" is once more restored. Merry Christmas! We then joined in Mass at St Francis, the oldest church in Victoria. On our way to the tram stop for our next visit, we passed very long queues waiting to visit the same display we had already seen. Lucky we came early! The children reckon the tram ride was the most fun. The driver must have only had stop and go buttons - each time the tram started everyone was jolted backwards, and then forwards when we stopped. 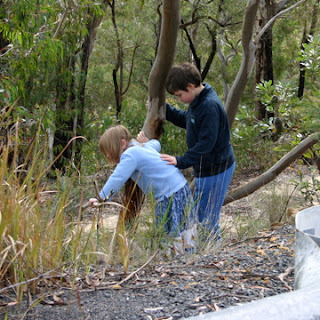 Our children were laughing and enjoying themselves thoroughly. Who wants an amusement ride when you can catch a tram instead! 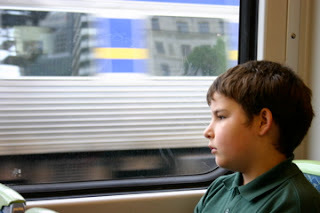 This last photo is of James looking out the train window on our return train ride. All the children were pretty tired after a full day. We are currently visiting my family in Melbourne for Christmas. Yesterday we went with my brother and his family into the city by train to see various Christmas displays and attend Mass at St Francis Church. We parked at the station and I asked the ticket seller "What is the best way for my family to catch the train to Melbourne?" He quickly got out his hand calculator and worked out 7 tickets at $2.50 each. "Thanks," I said and we boarded the train. 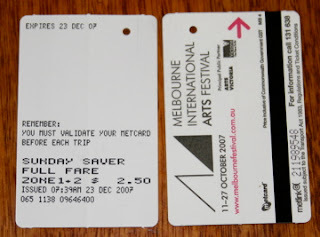 Once we arrived at Melbourne we put our tickets in the machine and were informed "Ticket Not Validated"
Perplexed, we approached a ticket inspector and asked, "The machine says our tickets aren't validated." "Your tickets must be validated." he cleverly (yet cheerfully) replied. "We purchased them from the ticket booth at the station and boarded the train," we responded. "Did you read the back of the ticket?" "See?" he pointed, "the ticket must be validated." "Wouldn't they be valid when I purchased them?" "He didn't tell us the tickets he sold us weren't valid." "Well, we are from out of town and our telepathy has failed us. Now what do we do?" "You're lucky the ticket inspectors didn't catch you. You would have faced fines of $160 per ticket." "Is this how you treat all tourists who fail this initial test?" He then let us through and validated the tickets, saving us from the dire threat of apprehension by the ticket authorities! This is a very well produced video of a homeschool family. It's well worth a look. 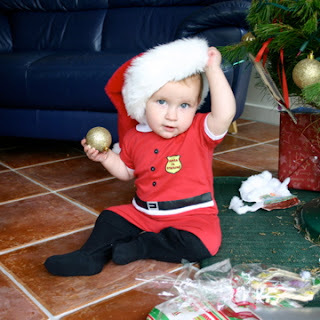 We are getting close to Christmas! The Pink candle has been lit in the Advent wreath, remembering "Rejoice Sunday", so the visual signs have begun. Both nativity sets are erected and Mary and Joseph are placed somewhere in the house to begin their journey to the stable. Each day I am to move them closer until they arrive on Christmas Eve. After we return from Christmas Mass one of the children place Baby Jesus in the crib. Apparently my anwers didn't fit the standard mould. Who would have thought? 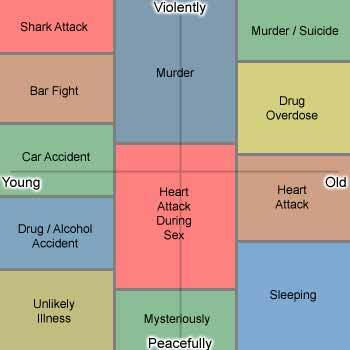 You are a different sort of person and your death will be unexplainable. Rose always wants to wear her little boots when she runs around outside. But sometimes she can't find them. So she makes do. 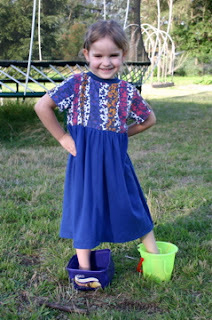 Here she is modelling her special boot replacements - an ice-cream container and a sand pail. The sand pail is not even wide enough for her foot so she has to tip toe in that one! Where were her boots? In the boot basket of course! Why would she look where they are supposed to be. They are never there normally. Today is St Nicholas' feast day. We try to do something special for the man so much linked to Christmas, but somehow we often forget until it is too late. This time David and I kept reminding each other. But early this morning I remembered that I had forgotten to make up the little bag of goodies for the children. Quickly scrambling out of bed I made the goodie bags, filling them with Dutch Licorice and small biscuits (pepernotens) - we didn't have any chocolate coins left. 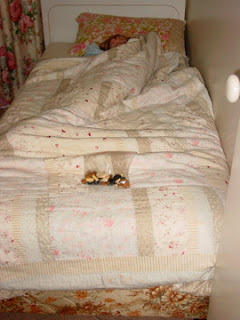 As I placed them on the ends of the beds I was caught by Eric who was soon due to be up. "Shh, don't worry about it," I whispered conspiratorially. James kicked his bag off the end of the bed even before I had walked out the door. Clare opened one eye as I took this picture of her. She then promptly returned to sleep. Rose had commandeered Ariel's bed sometime during the night, and we wanted to make sure she didn't take Ariel's treat as well so we kept Ariel's separate. (By the way, it is amazing that someone so small can take up so much room). Upon waking up the children were surprised and wondered what the treat was for and especially wanted to know, "Are they all for me?" I reminded them that today was St Nicholas Feast Day. Now they remembered and immediately began to trade for their favourites. We also printed out some colouring pictures and they sat around the table eating their treats and colouring pictures. This was such a nice way to start the day. Our Garden is bearing fruit! Since we first built our house and arranged for the septic soakage area to be in irrigation pipes, we have waited for some fruit from our well irrigated garden. This year we look like having a huge load of berries. We have begun to enjoy home grown Raspberries, Marian Berries, Young Berries and some other types which are just as yummy. Rose and Clare help Lana and her Mum collect the berries and we STILL have enough for baking! Survivors of a Sunk Cruise Ship. Why Homeschool has posted an email of one of the passengers who was on the cruise ship Explorer which sank off the coast of Chile. It is a well written piece by someone who was right in the thick of the event. It is well worth a read. I attended the funeral for my Grandfather on Thursday and met all of my relatives and their children. Henri had 5 children, 13 grandchildren and 22 great grandchildren and other than Lana and our children they were all there with their spouses, as well as many familiar faces from my past. It's a pity it takes this type of occasion to see one another again. My cousin had collected a great collection of photos of Henri and I thought this would be a good chance to post a couple more tales of Henri during the war. You can click either photo from more details. 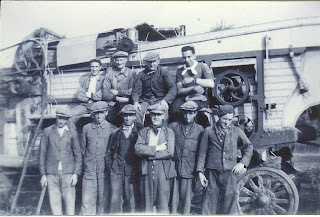 The first photo is of Henri and others in front of a Threshing machine he used when he was hiding from the Germans in France. Henri is the one on the top right. Notice how his dress is different from all the real farmers? He was a city boy and the only place to hide was on a farm in France. When he met his first French farmer and asked for work the farmer asked Henri if he had any experience. "Yes, lots," replied Henri confidently. "Show me your hands," said the plain spoken farmer. "Ah," stammered Henri as he showed his city bred hands. "I am hiding from the German work gangs. My wife and three small children are at home in Belgium and I need to help them." "Hmmm," murmured the farmer with his hands on his chin, "We'll see how you go." Finally Henri overcame the innumerable blisters and he wasn't too much of a hindrance to the farmer after all. Once the Allied troops had entered Belgium Henri quickly went home. 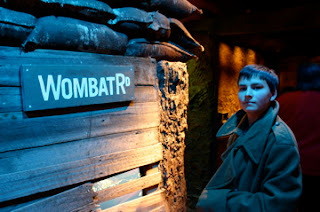 His home had been liberated, but the front was only a few miles from home and his parents were still in enemy territory. Henri wanted to see how they were and went towards their house. An Allied soldier stopped him and told him, "The Germans are that way. What are you doing?" "I want to see if my parents are OK."
"You'll have to wait until it's safe." the soldier told him. Henri wasn't patient so snuck around and approached his parents house. Allied soldiers were cautiously approaching the little village and some armoured cars were leading the way. Henri followed a short distance behind when the lead armoured car suddenly exploded with the turret flying into the sky amidst flame and smoke. Henri quickly dived into the nearby ditch and decided he might wait after all! This second photo is of Henri working on the British Spitfires. Once Belgium was liberated he was quick to help the Allies in maintaining their planes. 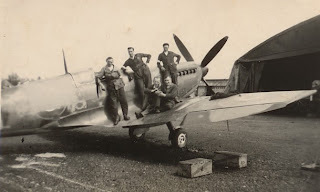 He is the one in the middle leaning jauntily against the fuselage. We are often asked, "How much does it cost to feed all those kids?" I have kept accurate records of our family finances for over the last ten years and know that our costs have actually matched inflation, even though our family has grown faster than inflation. (Inflation is around 3% per year) We spend around $1,100 (US $880) per month on all grocery shopping, food, cleaning products and whatever we get from the supermarket. The reason I am revisting this topic is Lana was concerned how much we were spending as she made today's lunch of Vegetarian Meat Lasagne. (This is one of our classic Vegetarians For a Free Choice recipes). "I was just concerned when I demolished my 4th pack of Lasagne sheets and saw all the empty packs surrounding me," Lana explained. As you can see by the photo, Lana bakes in quantity! The dish is 37cm x 28cm (15" x 11.5") and the pot is correspondingly large. The resulting dish actually makes dinner for two meals. 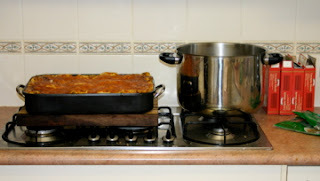 It incorporates over 3 packs of Lasagne sheets, 1 kg (2 lbs) mince, 1kg cheese, about 2 kg of vegetables and other bits and pieces. Total ingredient costs are about $30.00 ($24.00 USD) which equates to about $15 a meal for 8 people, or around $2.00 ($1.60 US) a person. For comparison of bought food for the same price, this would equate to about 1.5 pieces of pizza, half a fried fish or half a meat pie. Once I had calculated the numbers Lana felt that maybe it was all worthwhile after all. This morning my Grandfather, Henri, passed away. He was known to us as "Pater", our way of saying grandfather. The nursing home staff had brought him his breakfast and when they returned he had died. He was 93. Henri was born in Belgium. During WWII he was helped by the French and Belgian resistance to avoid the German work gangs which would have sent him off to work camps in Germany. One time he slipped back into town to see his wife and three small children. He was talked into staying at the pub a little longer than he should have ("You'll be right!") when a truckload of German soldiers parked out the front and guarded all exits. The sergeant and his troops lined up all the men along the bar and checked their papers. Henri had forged paperwork saying he was on vacation from his work camp. Once the soldiers arrived someone went and summoned my grandmother and my dad and his two older brothers who were all under 5 years old at the time. The Sergeant read Henri's papers and said, "These are expired. Your holiday is over. It is time for you to return to work." Then my grandmother came in with the three boys gathered around her legs, crying pitifully. The Sergeant, standing firmly with his men pointing their submachineguns at the men in the bar, looked at my grandmother and then Henri. "Right. Return to work tomorrow." He knew full well that Henri would never be seen again but like many German soldiers was a decent man. That night Henri was whisked away by the resistance back to France to hide out and work on a farm. In the early 1950's he had the opportunity to go to Australia - on the other side of the world - and be factory foreman for a tapestry company. It was a five year deal. At the end of the time he could come home (back to civilisation). He stayed. His five children all married in Australia and he left behind 13 grandchildren and lots of great grandchildren. This photo was taken a couple of years ago. 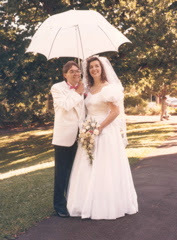 He had a walking stick but in any photos the stick was whisked away behind his back. "It makes me look old," he liked to remark. My tooth fell out but I lost it. Can I still get the money? This was written by Lana when she was about 10 on the back flap of an old envelope. Lana's mum kept it in her keepsakes area and we learned about it today. Just another great benefit of living with grandparents. 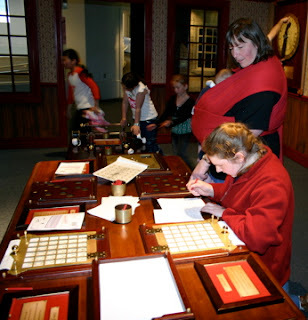 Yesterday we had a family day out by going to Questacon in Canberra. Questacon is a hands-on Science museum, very similar to the McWane center we visited in Alabama (Here, here, here and here). The first section we came to was "Sideshows" exposing all the tricks of the trade as well as demonstrating some of the rides such as a huge slide "Freefall", a centrifuge and a simulated roller coaster ride. 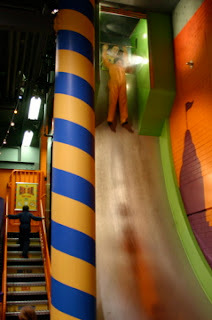 The slide had each participant put on overalls (called "Body Bags" by the attendant) climb some stairs, then hang on a bar two stories above ground and let go. One girl hung onto the bar and decided that letting go sounded like a pretty silly idea and had to be retrieved by the attendant. This photo shows James just as he let go. Peter is already on the stairs ready for another go. Peter somehow managed to get 5 slides to only 3 for James and Eric. Ariel decided that this type of thing was not for her. The roller coaster simulation was enjoyable. As the pod in which we were enclosed moved and bumped us around, Ariel said, "This is like your driving Dad!" 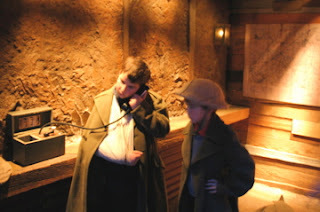 One of the exhibits centred around Spies and Codes. Eric and Ariel picked up the activity sheet which had the visitor go through the exhibits ferreting out the clues to answer the final mystery. This photo shows Lana helping Ariel unravel one of the secret messages with Martin snugly asleep encased in the Moby Wrap sling. Eric joined forces with another lad about his age and they worked out the answers pretty quickly. Lana, Ariel and Eric enjoyed the spy part as it was more involved than just playing. Eric, James and Peter liked the Freefall slide. James also liked playing with some tubes which attached to a metal wall by magnets, which you manipulated in such a way that a ball travelled from the top to the bottom. Clare enjoyed the show about balloons and hot air. Rose just liked playing with lots of things. And we all enjoyed the mirrors which distorted our appearance to long thin people and a short wide family. My photo plans during our trip was to upload them to my computer each night. This worked fine until the first night of the camp when the card reader failed during the transfer. I uploaded 42 out of 64 photos, but the card was now corrupt! I had stupidly relied on one memory card with no spare. The little town in which the camp was situated didn't have anything so esoteric as a SD memory card so I had two options. Either take no photos and see if I could retrieve the 22 photos when I got home, or reformat and lose the photos. I took the first option, so I took no photos beyond the first day. I wasn't able to retrieve the photos after all but I now do have a backup memory card in my camera case. 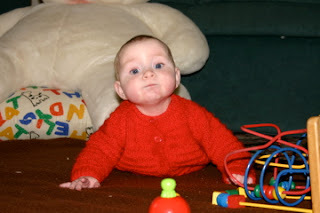 Martin is already 5 months old. Time certainly does fly. Many of our friends have asked how he is going so here he is! He dribbles constantly, lubricating a passage for teeth that must be on the way. He is pushing himself up and can rollover which means we are at defensive stage 2 - no more leaving him alone on the beds and remove inappropriate things from his near vicinity. A highlight of the camp is the Sports Carnival. One of the dads handles most of the organisation (here is our report last year) and every child has a go. Even our less than athletically gifted children each get a participation point just for entering each race so help their team. 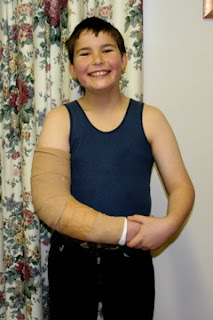 James was so intent on doing his best he strained his recently repaired arm during shotput. He didn't tell anyone and went in the 1000m (5/8 mile) marathon. I saw him crying as he neared the finish line and helped him finish the race. "What's wrong?" I asked, "A stitch, did you fall over?" "No," James replied and told me how he strained his arm. So we bandaged it up and by the evening he was much better. At the beginning of the sports award ceremony James was called to the front. "Who me?" he asked with a shocked expression. "Yes, you. Come on up." The organiser and one of the priests had their hands on his shoulders and told the audience how he had gone that extra distance just to get the participation point. James was quite embarrassed - but happy too. Ariel was also embarrassed. She won the "Best and Fairest" award. 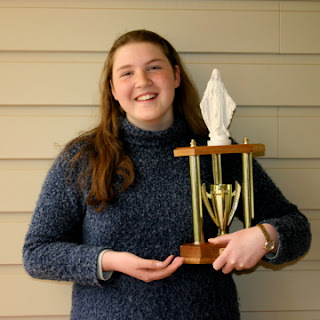 This is a perpetual trophy and is awarded to the child who is the most helpful and generally all round good child for the camp. Ariel's face at the moment her name was announced as the winner was worth a photo. But I missed it so she is shown here after the event. We also learned new games from other families. 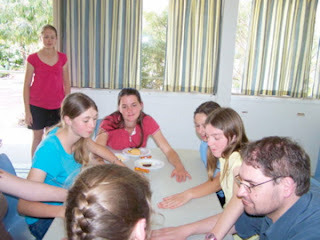 In this photo I joined Ariel and her friends playing "Hands". Players sit around a table and place their right hand over their neighbour's left hand. Then it begins. One tap means go forwards, two taps means reverse and three means skip the next hand. If you don't tap when you should that hand is removed (from the table, not surgically). It gets quite tricky especially after hands are removed. For example, I tap my hand once on the table and the person on my right taps their hand once and the next hand taps twice. So it reverses and the next hand taps once and I have to tap again. If I tap 3 times, the hand on my left is missed and the next left hand has to tap. 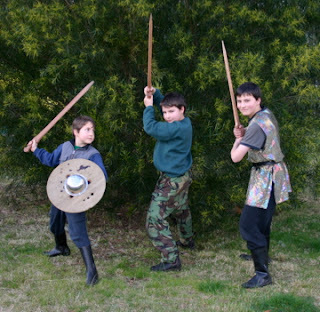 Last year I was asked what Dads do at homeschool camps and I will answer the question again this year. Dads get involved in the organisation, talks, sports and everything else as homeschooling is a family affair, not just Mum's job. 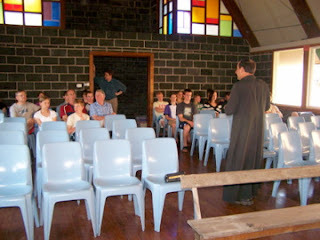 There were a number of talks and catechetical activities organised and the priests asked that the Dads to listen in to the talks for older children. (That's me by the door while Father gives his talk). One of the best activities for the fathers was the night we had a men's talk and the ladies had their own. We all gathered in one of the halls with a cup of coffee or some dry biscuits and followed an agenda. The discussion was great with each of the dads giving their perspectives on raising children in today's world. By 10pm we stopped and went to round up the younger children and see them to bed. I noticed Lana wasn't back from her talk so went to the cabin in which the ladies had gathered. There I saw the remains of cake, fancy biscuits, cheese and crackers, some wine and all the elements of a fine party! Typical! We hadn't though of that. Next time we'll arrange something little bit more physically rewarding to go with the mental feast. 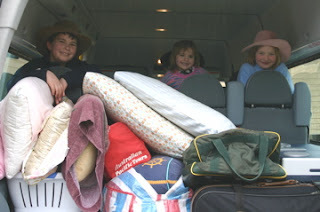 We finally made it to the camp and quickly unloaded the van contents into our cabin. The children promptly vanished and found new and old friends. A Sand Castle competition was arranged for the first afternoon's activities and somehow myself and one of the other mums were made judges. We had three boxes of chocolate to award as prizes. We decided to award a prize for the best Traditional, Artistic and Tenacious sand castles. The first two weren't too hard to select, but the third had a number of groups of children in the running. 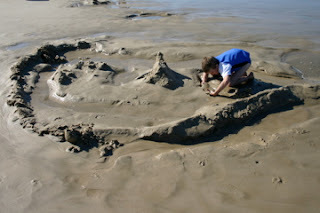 This first photo shows one of the boys in James' group trying to resurrect their castle after a rather devastating wave. 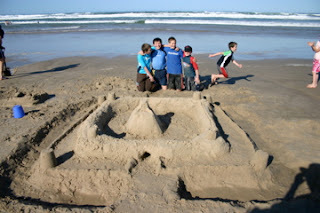 Meanwhile Eric's group of boys started their castle for the 4th (!) time. The first three were washed away to steady groans. But their castle did survive in time for the judging and won the most tenacious category. Here they are showing off their creation. The older children/young adults started off spectacularly with several spades and lots of assistants. They achieved a mound of sand about 5 feet high. Then they were distracted by other things and so ended up with just a pile of sand. "Why didn't we get anything?" one of the young adults asked on the awards night. "A pile of sand didn't qualify for the traditional or artistic categories and you all eventually gave up and went swimming so it didn't qualify for tenacious either." "Well, there is that..." he replied. So next time we will do better. There is always next time. Our next stop was near Kyogle so we could visit friends that had recently moved nearby and attend Mass just over the border at Marian Valley, Canungra. 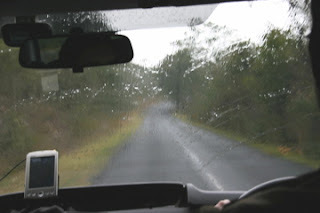 Once again it was more winding roads and hills, but with 7 back seat drivers (luckily Martin hasn't started criticising my driving yet) I drove a lot slower and was more conscious of the effects of the roads on my rearmost passengers. 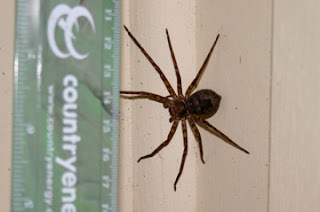 We stayed at a fairly basic caravan park that was adjacent to the rain-forest, so it didn't surprise us to see this not so little spider in the ladies toilet/shower block. The children were all reminded to observe the important lesson to shake out their shoes before putting them on in the morning. Our friends have taken over a Free Range Eggs farm so the children had the treat of riding quad bikes and collecting eggs while Lana and I had fun chatting and learning all about how the eggs are gathered, cleaned, sorted and distributed. On Sunday we drove 90 minutes to Marian Valley for Mass. It wasn't as exciting as last time we visited, but we had a great Mass and met many good families afterwards. Then it was back to our rooms and getting ready for the homeschooling Camp tomorrow! Tamworth bills itself as the Country Music Capital of Australia. They have plenty of Country music festivals and events, the Golden Guitar museum and tourist trap, and lots of musician based statues and localities. 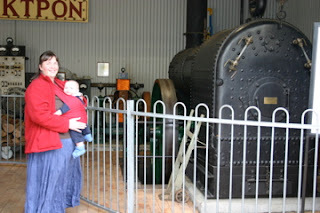 One place which we did not expect was the Tamworth Powerstation Museum. It is a museum devoted to electricity, especially as it was used in Tamworth. In 1888, Tamworth was the first town in Australia to have electricity powered street lights. Sydney only had their street lights powered by electricity 6 years later! 19 years later Tamworth homes were also connected to electricity. As today was off peak, the volunteers had plenty of time to lead us through the museum and explain many of the items to us. The entry fee was only $6.50 for a family and we received a personal tour! They have collected a great many electric powered devices, including old fridges, stoves, irons, washing machines and so on. Our guide allowed each of us to feel how heavy an old electric iron was and asked Lana how she would like to iron with that. "I don't iron," promptly answered Lana, "All of our clothes don't need ironing. Even easier!" In 1988, volunteers reconstructed two steam powered engines which powered the dynamos that provided the first electricity in Tamworth. They found examples of the old engines rusting away in sheds somewhere but all they had for the dynamos were a sketch drawing. With that and some extensive research and lots of ingenuity they rebuilt the dynamos! On special occasions they start up the engines and it all works as it used to. Lana is standing in front of one of the rebuilt engines. 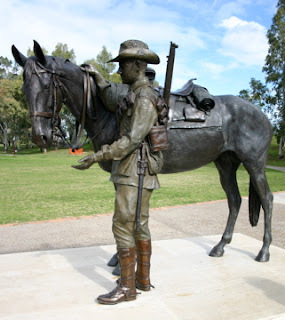 In the park where we had lunch was a statue dedicated to the Lighthorsemen, especially those that served in WWI. Over 500,000 horses from the Australian outback were sent to the Middle East. Most didn't return. Not due to casualties, but because Australia didn't want them back, due to a combination of Quarantine issues and the sheer cost of returning them home. The B-Where's version is here. The Chef is a Rat! Part of our holiday treat was to see Ratatouille. Actually, the treat was to take the family to a nicer restaurant - all you can eat - which the children thought was a pretty good idea. 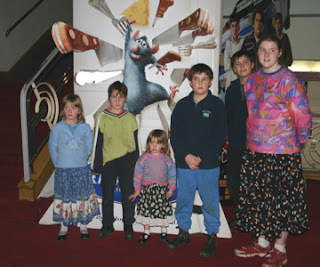 But then one of the children mentioned the cinema and we realised that today was the day Ratatouille would first show. Normally we avoid the cinema as it costs a lot more than buying the DVD and watching it at home. However, we negotiated and traded a nice restaurant for a family movie. 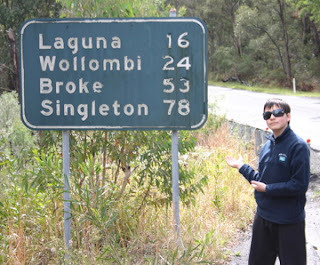 When we lived in the US we laughed at local place names. But just to show you it wasn't just America that has interesting place names, here is one of the road signs showing the towns we went through on our trip. The biggest challenge is working out how to pronounce the names. It is not always as you would expect. 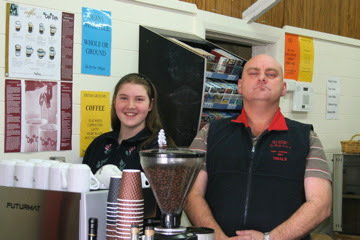 For example, one town that is near where Lana grew up is called Wauchope. This is pronounced War-Hope. Lake Cathie is pronounce Lake Cat-Eye. I am pretty sure this is just a quick way to work out who the locals really are! The best named place was one we passed through a few days later - Wonglepong. Now that is a name to impress outsiders! 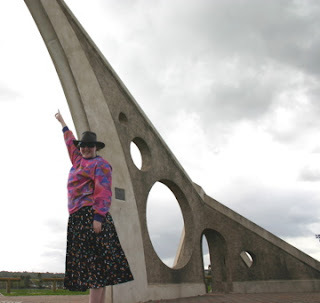 Singleton NSW boasts the "Largest Sundial In the World." Ariel is our model demonstrating the size of the thing. We couldn't really fit the top into the picture and be able to see Ariel too! It is very big, I grant you, but what is the point of a sundial if there is no sun to actually help with telling the time. Is this a case of an early technological power failure? Our last photo is on our photo blog B Where's, showing Rose Pointing in front of the sign announcing Rose Point. And she looks so cute in her sunglasses. We really couldn't help ourselves. 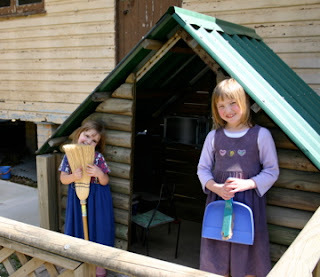 We have been planning our annual holidays for some time, coinciding with the homeschooling camp which is on next week. This time we are taking the inland route to visit some friends and explore new places. We left Lana's parents to mind the fort on a wet and cloudy day. We really appreciate the extra luggage space in the Ford Transit van. As you can see we have some room spare after packing sleeping bags and linen for all the children, pillows for everyone and blankets and linen for Lana and I, as well as enough clothes and essentials for the trip. One game we played was "A to Z". This involves everyone looking for a sign or word starting with each letter in order - car licence plates are excluded. As we were on the freeway much of the way, most of our results were truck or road sign related. When the letter "J" was announced, Clare quickly answered "James!" Then it was a new rule clarification - all results had to come from outside the car. The weather was very variable. Light rain, clear, heavy rain, then drizzle and clear again. We decided to rely on the GPS and take a shorter route off the main freeway. This saved many kilometres, but unfortunately was a very winding road. As the van is rather long each winding part meant the rear seemed to move even more. By the time we had come through that section everyone behind the driver's seat was feeling queezy. "I feel sick." Clare announced and I VERY quickly pulled over and everyone scrambled out. This photo is of James helping Clare who was feeling very unwell. Today the boys, Ariel and I visited a Napoleonic Wargaming demonstration. While I was with James looking at some historical swords and equipment, Peter and Eric were sitting watching a large Waterloo style wargame. Ariel was sitting by the window reading a book. She reckons wargames are boring for girls. A regiment of Cavalry had forced some infantry into squares. This meant the men in the unit face bayonets out and the men behind them fire, making them safe from Cavalry who won't charge home through the sharp points. Peter watched carefully and mentioned to the fellow in charge of the Cavalry, "With the Cavalry don't charge. Use the cannons to fire into the infantry. That makes holes in the defence so the cavalry can go through." The men playing the game stopped and looked at Peter. "That's actually pretty good tactics," one said. "Where did you learn that?" another asked. Peter answered clearly, "We watched the movie called Waterloo." A fellow on the other side of the table said, "How old are you?" "He's 21" someone answered with a smile. "Look, there's a horse over here," one player said pointing to the figure of the General, "Hop on it and be a General!" "The French are doing poorly. They need your help." Peter just stood there looking at all these men talking about this young lad of 8 discussing quite intelligent Napoleonic tactics. It was pretty funny. Ariel couldn't concentrate on her book. Peter understands what is involved not just from the film, but the discussions we had during the film. As the battle in the film unfolded I explained what the impact was and why certain tactics were poor and what worked better. Peter obviously absorbed it all and applied it at the right time. Telemarketers: We have a deal for you! Lana was having one of her brief periods of quiet feeding Martin when the telephone rang. An Indian accented voice answered "Hello, This is blahblah blah. We have a special deal offering a family package of 25 nights free accommodation for $299." Lana paused and thought she would give them a challenge. "We have seven children. Not many hotels handle that many children. How would your deal handle this?" "I'll just get my supervisor." 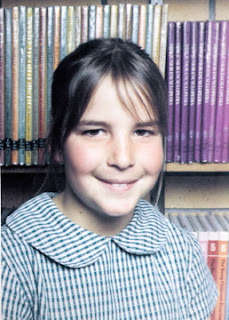 A short while later, another Indian accented lady answered, "this is Sandra Parker. You have seven children?" Lana gave the ages, enjoying the challenge. "I'll just speak to our manager"
She asked to call back and finished the call. A short while later she called back and got really pushy. "2 kids stay free, plus a no-name mp3 player all for $299." "Does he like to save money?" "He's an accountant. Of course." Lana replied, "He doesn't like those kind of surprises! Undiscussed spending is not a pleasant surprise." "No I'll talk to him and get back to you or it's NO right now." Sandra backed down and arranged to call back at 4:00pm. Looking up the web site, Lana read all the conditions. The "Free" accommodation relied on buying breakfast and dinner at the hotel for two adults, or pay for one night and get the second night free. Investigating further, Lana realised that there aren't that many hotels in the areas we would visit so for us there was little value. Sandra called back at 4:00pm on the dot and decided to try strong arm tactics, little realising that Lana is NOT going to spend money if she doesn't want to, and the resistance grows stronger the more she is pushed. After lots of wheedling and coaxing and suggestions of "You should take a holiday" and "This is a great deal" and "You'll save lots of money" and so on, Lana eventually told her in no uncertain terms that "We are NOT interested." I must say Lana enjoyed the challenge she posed to the Telemarketer. 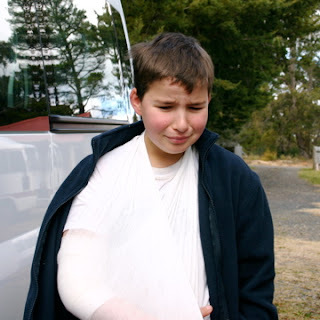 On Friday I returned home from a busy week in the city to a sad James with his arm in a sling. "I fell of the trampoline and hurt my arm, Dad." Lana and her mum had done the important things. There didn't appear to be an obvious break as James could wiggle his fingers and clench his fist. So we wrapped his elbow, gave him some Panadol (Paracetemol) for the pain and he had a fitful sleep. The swelling had reduced overnight but he was still in pain. Hmmm. One more night. After Mass we unwrapped his arm again and noticed a little bruise on the inside of his elbow. Now the only pain was at his elbow but it was strong pain. "Okay James. We're going to the hospital." The first photo is his reaction. So, off Lana (and her attachment, little Martin) with James and I to Hospital, about 40 minutes away. The triage nurse gave us "the look" when we said James had injured himself on Friday at about 4:00pm. Anyway, 1.5 hours later we saw a doctor who gave us a slip for us to get an X Ray. Then James was X Rayed with much pain as he was made to straighten out his arm as the technician and I hid behind a glass pane. He felt it wasn't a break because of the movement of James' hand and fingers but we were sent back to the waiting room for the doctor. Eventually the doctor called us in and told us there was a small break just above the elbow. It was more like a tear or crack but James was to have a plaster cast. It should take 8 weeks before it gets removed. All in all we returned home 5.5 hours after we left. But James is much happier (as you can see in the "after" shot). So, that was today's adventure.